One of my favorite things about the annual Macworld/iWorld show is checking out the unique gear from smaller, lesser-known vendors and from the “We make so many different things that you’re bound to find something you like” companies. Nite Ize is one of the latter. I first encountered Nite Ize many years ago, when the company concentrated on nifty flashlights and flashlight accessories. But the company has since expanded to the mobile-accessory market, and the Nite Ize booth at Macworld/iWorld is a veritable gadget-geek’s gallery. At this year’s show, three products in particular caught my eye. I’ve been using them for the past few months, and each has proved itself useful. Just as impressive, each is relatively inexpensive. Despite my digital-focused life, it’s convenient to have a pen handy, and though I’m not a frequent stylus user, there are times it’s nice to have one of those around, too. Alas, I usually have neither, because I don’t want to deal with carrying them. 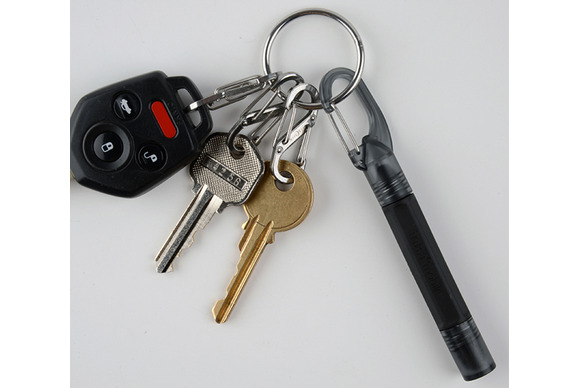 The $12 Inka Mobile Pen + Stylus offers a solution: It’s just 4.3 inches long and weighs just 10 grams, yet that compact profile features a ball-point pen, a rubber-nib touchscreen stylus, and a small carabiner clip for attaching the Inka to your bag, belt, or key ring. The pen itself is pretty good, and the stylus, while not the best stylus you can get, is better than many I’ve tested that cost more than the Inka. The Inka’s thick barrel is even manageable with gloves on—you can clip the Inka to your ski jacket for using your iPhone on the slopes without having to expose your fingers to the elements. Back in April, my colleague Serenity Caldwell reviewed the $26 Pocket Tripod, a tiny, fold-up iPhone stand she discovered at the Macworld/iWorld show. Nite Ize offers a similar take, but for quite a bit less—$10, to be exact. Like the Pocket Tripod, the QuikStand Mobile Device Stand is about the size of a business card: 3.4 by 2 inches when folded up, and only 0.2 inches thick. Made of aluminum and polypropylene, it weighs just 10 grams, and it easily slips into your bag, your pocket, or even your wallet. When you need a stand, you just flip up the aluminum backplate, and then flip up the aluminum support piece and insert it into one of nine slots in the backplate to pick your stand angle. You then flip up a small, plastic tab in the front of the stand to hold your device in place. The stand can accommodate an iPhone, iPod touch, or even an iPad mini—though not a full-size iPad—with or without a case. An iPad mini is sturdy in landscape orientation, though it’s a bit shaky in portrait. Given that the stand’s hinges are made of polypropylene and require bending whenever you use the stand, I don’t know how they’ll hold up over time, but they’re still solid on my QuikStand after a few months of use. Most bike/bar mounts for smartphones require you to permanently (or at least semi-permanently) attach mounting hardware to your bike, and most are made for a specific device. Nite Ize’s $20 HandleBand Universal Smartphone Bar Mount takes a different approach. The HandleBand’s silicone-strap approach lets you use it with any phone, and you can position your phone as far up or down (or left or right, if mounted in landscape orientation) as you prefer. You can even use the HandleBand to temporarily mount, say, a flashlight or a small portable speaker. One downside, however, is that you have two thin, silicone strips obscuring bits of the screen. I found these stips to be occasionally annoying, though some conscientious positioning of my iPhone usually let me minimize the obstruction. Oh, and one of the HandleBand’s metal frame clips is also a bottle opener. How many bike mounts can say that?